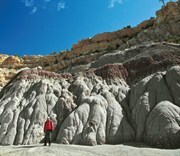 All five areas within the badlands—the little-known Mesa de Cuba, Mesa Chijuilla, Mesa Penistaja, Ceja Pelón, and Cejita Blanca—offer moonscape-like scenery and multihued rock sculptures. They also harbor amazing old trees: Solitary, twisted ponderosa claw at bare mesa edges, and groves of 1,000-year-old junipers thrive on stabilized sand dunes. All five badlands lie along an east–west line stretching from Cuba and are best accessed from the south. Within each unmarked scenic area, hiking difficulty can range from easy to moderate to strenuous, depending on the path you choose to cut. The diversity of terrain allows hikers to design their own excursions, but, as with all outdoor activities, caution is as important as nutrition and hydration, all of which you’ll have to provide. The village of Cuba is a 15–20-minute drive from the Mesa de Cuba. The sites have no established trails, and no significant sources of potable water or food in the immediate vicinity. Precipitation in the area can make some dirt roads difficult to navigate without a four-wheel-drive vehicle with high clearance; some roads require both even in good weather. 1. Mesa de Cuba This area stretches for three miles along the west side of its namesake village. Many steep-walled, hoodoo-filled box canyons separated by narrow, intricately sculpted ridges resemble an exotic city where winding lanes pass countless bazaars and alleyways filled with larger-than-life statues. 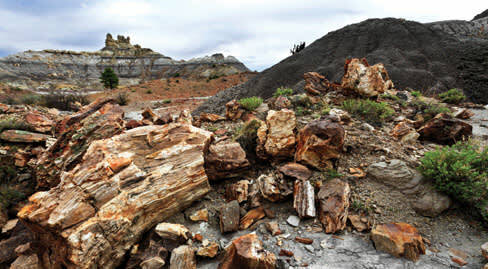 Petrified wood is strewn everywhere, from chunks of various sizes to entire logs. Huge, round, rust-colored stones called iron concretions, some up to five feet across, lie scattered like forgotten marbles. GETTING THERE: Turn off U.S. 550 onto N.M. 197 at the S. end of Cuba, and curve S. and then W. around Cuba Mesa for 5.5 miles to a right-hand turnoff onto a two-track dirt road. You can park here and hike E. to the mesa base, or continue 1 mile N. along the rugged dirt road to another convenient starting point. This is the most intimate of the Cuba badlands. 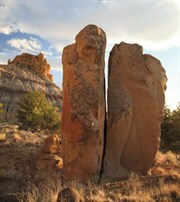 The 5-mile-long, east-facing mesa base is scattered with huge, bright-orange-and-red boulders, and impressive hoodoos silhouetted against lushly textured, white-shale mesa walls capped with thick sandstone. The detailed beauty here lies in the richly eroded shapes and the patterns painted from a vibrant earth-tone palette. Desert varnish—the thin, red-to-black coating found on exposed rock surfaces in arid regions—adorns cliff tops, and lonely bonsai ponderosa protrude from solid rock. GETTING THERE: The turnoff for Mesa Chijuilla is 0.2 mile past the junction of N.M. 197 and the dirt road that is the main access route from the S. for all four of the badlands beyond Mesa de Cuba. Continue north on the turnoff 3 miles to the first parking area and the hoodoos clearly visible to the left, or continue N. another 2.3 miles along the mesa base; park wherever you want and walk over to the mesa. Continuing west, this area has an extremely complex perimeter surrounded by dozens of smaller, equally complicated mesas and buttes. The result is a canyon labyrinth, and miles of mesa edges carved into fantastically shaped cliffs overlooking numerous hoodoo galleries. Isolated mesa tops hide superb, naturally landscaped botanical parks showcasing our high-desert vegetation’s incredible hardiness and beauty. Huge petrified tree trunks decorate the canyon bottoms. GETTING THERE: Mesa Penistaja is accessible from the original dirt road by continuing W. for a total of 16.9 miles from the initial junction of U.S. 550 and N.M. 197, and taking a right (N.) turn onto a smaller dirt road. Take this road 2 miles N. until you see the Mesa Penistaja badlands on the right. Park where convenient, then head E. to the obvious hoodoos. 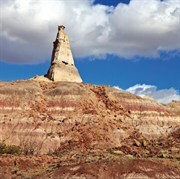 To access the interior of Mesa Penistaja, you must climb over the mesa and hike a short distance into the hoodoo maze. Adjacent to Mesa Penistaja, the Ceja Pelón badlands have three distinctly different levels. The second or middle level is carved into long, thin, projecting fingers that form a series of narrow box canyons below. Brilliantly colored petrified logs dot the edges of the canyons. Several portions hold ancient logjams in which dozens of 50-foot-long broken trunks, still lying in place, are piled across each other at various angles. A towering, elegantly tapered spire grows from the first level to form an impressive centerpiece landmark. GETTING THERE: The access road into Ceja Pelón is another 0.6 mile N. from Mesa Penistaja, and on the left. This route requires four-wheel drive, or you can park and walk the half-mile to the mesa base. 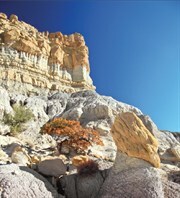 Cejita Blanca is a hidden world guarded by a ring of intricately sculpted sandstone cliffs. The bowl-like interior encloses three large, stabilized sand dunes that support magnificent old-growth juniper groves—some of these arboreous patriarchs are 1,500 years old. Long, winding slot canyons with multiple branches penetrate the encircling rim. Their broad, sandy, easily hiked bottoms lead past multicolored shale walls to hoodoo galleries and stashes of petrified wood.